The classic 53 metre Feadship yacht Mirage was pristine following a three-year refit — but then disaster struck as fire ravaged her interior. Undeterred, her owners and project manager have begun work once again to bring the boat back to her award-winning glory. By 10pm both the crew and the guests could smell smoke; it wasn’t long before the smoke detector in the skylounge screamed into life on board superyacht Mirage, as she was moored alongside in Puerto Portals, Mallorca. It was the height of summer — 24 July to be precise — when a small fire escalated very quickly with a full complement of guests and crew on board. Richardson raced to the upper saloon and emptied a CO2 canister on the area he thought was the source of the blaze, most of which was hidden behind wall panels, while the engineer hurried to kill the ship’s power. In the darkening night, steam from seawater hitting the fire and hot metal mixed with smoke to create zero visibility inside the skylounge. Still, the Mirage BA team of Josh Herant and Andries Ingle attacked the fire at its logical points of origin and likely spread. “They [the crew] went at it with everything they had and knocked it down quickly — 20 minutes from the first alarm and 10 minutes before the local fire brigade showed up,” says Richardson. There was significant heat emanating from the interior and, as the crew continued to train water on hotspots, the fire brigade went at Mirage’s beautiful new Oldenburger interior with axes, seeking smouldering areas that could reignite. In all, Richardson estimates eight tonnes of seawater were hosed aboard Mirage. While the crew hastily arranged accommodation ashore for the owner, guests and themselves, Richardson and his chief engineer spent the night on deck, one at the bow and one at the stern to maintain watch. In the light of day, they assessed the boat. Though fire and smoke damage was contained in the upper saloon only, salt-water damage affected the main saloon and three lower guest cabins on the port side. “Rather than patch the obvious wet electrical systems, structural fire protection and fabrics, it’s all going to be replaced so nothing will be suspect,” says Richardson. “We will be looking just like we did last summer.” That’s because, last summer, Mirage was in the best condition of her life. Built in 1979 at Feadship to the classic Dutch style developed by De Voogt Naval Architects, the 53 metre yacht underwent a minor refit in 2006, lengthening the stern. When sold in 2012, however, Mirage’s new owner had big plans. The aim was to return her to her original beauty while bringing all equipment and facilities up to modern luxury standards and the latest safety requirements. After a refit that must be one of the longest on record — about 90 per cent of the yacht was renewed — Mirage spent a successful early summer of 2016 cruising and chartering. Not only was the manner of this refit unusual — done in stages because the new owner expected to cruise the yacht during the summer months — but the shipyard in which the work was done is unique. The STP yard in Palma, Mallorca, is one of the largest in the Mediterranean and it has superb facilities for mooring and lifting out superyachts, but much of the work is done by subcontractors, many highly skilled and attracted to the quality of equipment at STP. Direction comes from captains and crew or independent project managers. In the case of Mirage, that was Paul Madeley. “This refit [took] three years of my life,” says Madeley. “But it was wonderful to have an owner who was so co-operative and so open to all our proposals. We had to find many inventive solutions to bring Mirage back to life.” It was such a successful project that it won a 2016 World Superyacht Award for Best Refitted Yacht. If the fire in July had any kind of silver lining, it’s that the team already have the perfect blueprint to follow to bring Mirage back to her award-winning state. “The design work is done. We are back at STP and we know the vendors we used before,” says Richardson. The original refit began with British studio Design Unlimited drawing up detailed plans of what the final result would look like. Steve Rice, the company’s creative director, recalls: “She was looking very tired. We had a good idea of what the owner might be looking for, but he and his wife wanted to be involved at every stage, so we spent a lot of time with the details. “The original plans were fairly basic and when we started to measure up the hull and accommodation it became apparent that nothing was quite like what was shown on the plans. Back in the 1970s, steel hulls were built to very approximate dimensions.” The first stage of the refit, which began in December 2012, was dedicated to upgrading Mirage’s electrical system and, as a priority, bringing the crew accommodation in the forward part of the hull up to modern standards. Mirage’s original electrical system operated on the US standard, using 110V and 60Hz. Changing it to the 240V and 50Hz of European standards involved a partial rewire and new shore power converters. 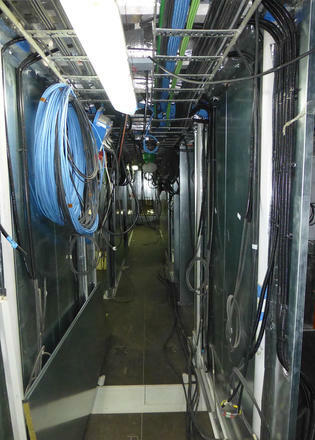 To house this equipment, the twin lazarette areas were converted into a single space. 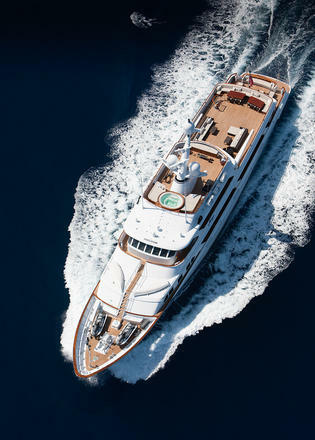 Other first-stage work involved non-critical areas such as refitting the upper saloon and reinforcing its overheads to be ready for modifications to the superyacht sundeck above. 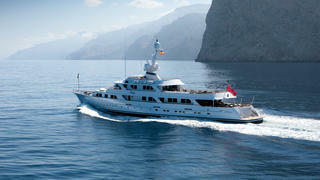 The upper saloon was fully enclosed with glass sliding doors and a huge 2.4 metre TV screen. 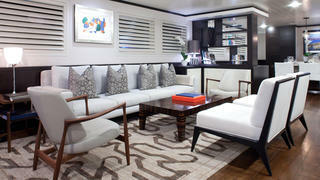 The main saloon and dining area were also fully upgraded to the new décor plan developed by Design Unlimited. “In these areas we tried to raise the deckheads as much as possible to increase the headroom, which we found low by today’s standards,” says Madeley. 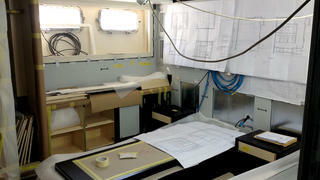 In Mirage’s crew area, six double cabins with en suites, a mess room and galley were created. 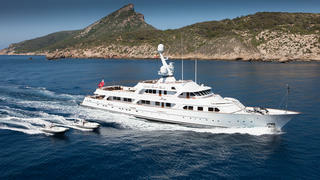 The first phase of the project was completed in only six months and Mirage was ready to begin cruising. Four months later, she returned to STP to start the major part of the transformation. For the next nine months, Madeley focused on work inside the hull. The engine room was stripped, apart from the main engines and their drive trains. This allowed access for the structural work required to reposition the stabilisers so they would be more effective and produce less turbulence and noise. 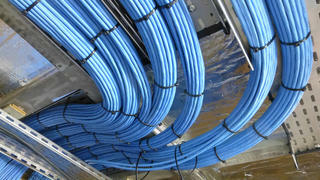 Virtually all of the auxiliary equipment, such as Mirage’s generators and pumps, was replaced. After the engine room rebuild, only the two 839kW D399 Caterpillar engines and their gearboxes remained. “The owner liked the idea of retaining these veteran diesels, which have no electronic systems and are purely mechanical diesels,” says Madeley. A detailed study of the requirements for sound reduction led to an insulation package, which, because it soaked up much of that eight tonnes of water, now must be completely replaced. Superyacht service centre Astilleros de Mallorca did most of the engineering work and structural alterations to the steel hull while progress continued on rewiring the electrical system. 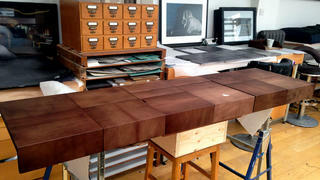 Meanwhile, German joinery company Oldenburger was prefabricating the new interior. “We are having a bit of a discussion about restoring the interior with the insurance company. The owner says like for like and this isn’t a Boy Scout hall,” says Richardson. 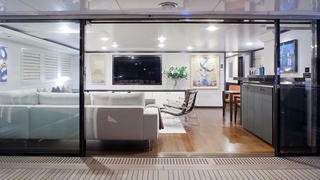 Design Unlimited collaborated with the owner on the style and decoration of the cabins on board Mirage. 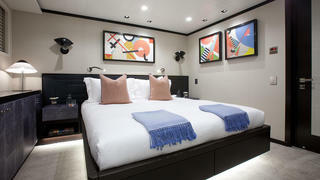 For the guest cabins in the stern they decided that each would have an artistic theme — cubism, surrealism, op and pop art, expressionism and suprematism — which not only influenced the design but also details such as lights and hardware. Of course, there would be paintings in each style. 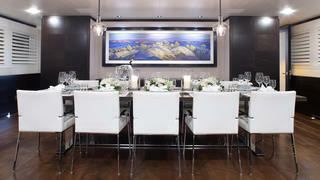 For overall cohesion, Design Unlimited relied on a background of dark wenge wood and lighter panelling on the walls. The doors were framed in wenge with silk panels creating a high-quality contrast. 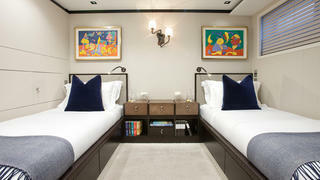 The overall effect was — and will be again — entirely in keeping with the traditional atmosphere of this classic yacht. The owner's cabin and VIP suites are on the main deck forward, with the owner enjoying the full width of the superstructure, allowing excellent views from Mirage’s side windows. The muted colours and comfortable furniture create a very restful style. 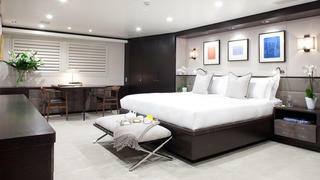 Much the same approach is seen in the VIP cabin just aft of the owner’s suite. 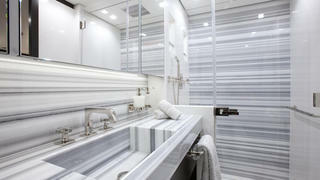 The two are separated by their luxury en suite bathrooms. Before the owner’s second summer cruising season, the foredeck was reinforced to support a new Opacmare crane to launch the rescue boat, wider freeing ports were cut and escape hatches installed from the owner’s bedroom and from the engine room. Elsewhere, the teak decking was renewed and all the teak caprails were restored to their original condition in a specially erected workshop ashore. The final stage of the refit began in September 2014 with the focus switched to the decks. The bridge deckhead was strengthened to support the three-tonne weight of a superyacht spa pool on the flybridge, which was prefabricated and installed as a unit filling the front of this deck. A new mast and funnel structure was created, the latter a work of metal-shaping art thanks to its double curvature plating, matching the traditional exterior styling of Mirage. 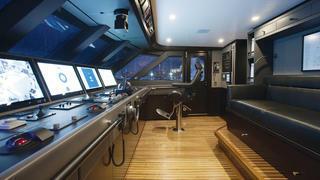 The bridge was gutted and rebuilt complete with all new electronic equipment including the latest ECDIS. 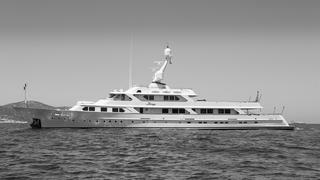 Though not a statutory requirement for yachts under 500 tonnes, it brings Mirage up to the latest standards. The captain’s cabin aft of the bridge was refitted and essential wing control stations added. Far below, a new soundproofed engine watch room was installed and the pantry fully refitted. Mirage emerged gleaming from this final phase in late 2015, making the fire doubly tragic. “It was a bit frustrating for us that the fire happened in late summer when most of the trades in Spain go on holiday,” says Richardson. “But if it had to happen, Mallorca was the best place. We spent three winters here, this will just be number four. Our goal now is the Barcelona Charter Show in April 2017.” We bet Mirage makes it.